I can barely stand the wait any longer. It's been what, 18, 19 months since we lost our primary access point to the Carroll Street subway station? The plaza work is complete. I'm pretty pleased with the aesthetics of the renovated plaza space, especially happy that we succeeded in preserving the mature plaza trees. The Smith Street exposure has received a couple of new street trees as well as all new sidewalk. I'm wondering what will occupy the new commercial space on the corner. I like the Subway Entrance 24 hour globe lamp on the left, positioned out toward the edge of the sidewalk to maximize visibility down 2nd Place. We fought a long hard battle to reduce the height of the building. We ultimately won the fight for contextual zoning for all of Carroll Gardens . . . but lost the battle on 360 Smith. The BSA granted the original developer a variance. So, 360 Smith ended up bigger than we would have liked. But the Plaza space and mature trees were largely preserved, and the ugly fence and surface parking area has been replaced with a new planted courtyard on 2nd Place. I dare say that the street level experience on this corner will be a great improvement over what was there previously - and not just because of the new plaza treatments and courtyard plantings. Add in the new street trees on either side of Smith Street and the Transit Garden across 2nd Place and this intersection will have gone from a relatively barren area to one of the greenest spots in the 'hood. It's going to take a while for all those trees to grow up, but the end product is going to be a much improved crossroads. Bonus shot: new street plantings courtesy of Parks in front of Frank's, where you can get a heart-stoppingly delicious stack of pancakes any day of the week. Since I took the pictures I noticed someone has added some flowers to the tree beds. Nice touch. Things have been a bit busy around the FirstandCourt household over the last month, and there have been quite a few stories I just haven't had time to address. 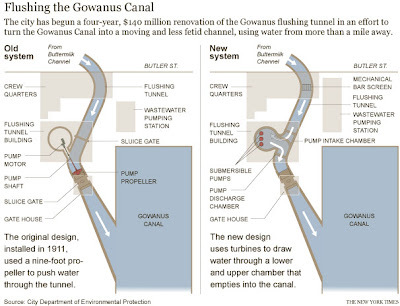 Most will be lost to the ether, but this New York Times City Room piece on the Gowanus Canal Flushing Tunnel was too good to let slip by. 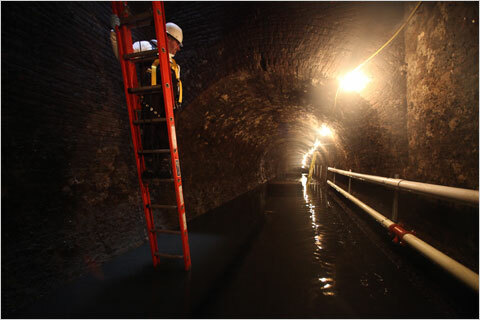 It's one of the best examples I've seen of informative journalism on the Canal and has some amazing photos from inside the flushing tunnel that I had never seen. I've snagged one here as a fair use, but I encourage you to click through for the full article and pictures. The flushing tunnel/force main facility runs deep beneath Degraw Street all the way to Buttermilk Channel; the force main will hook up with a sewer connector just west of Columbia Street. The construction presence is obvious on Degraw Street at Tompkins Place and between Hicks and Columbia. The article prompted me to go back and upload DEP's update on the Flushing Tunnel / Force Main project to Community Board 6's Environmental Protection Committee on October 25, 2010. I've embedded the whole powerpoint deck below for convenient reading. Simply put - it's not enough. 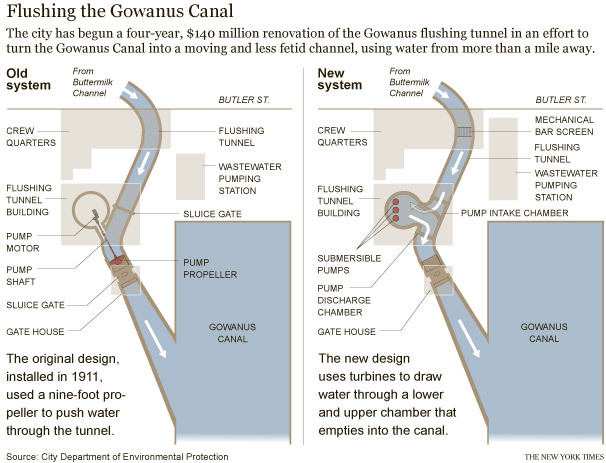 The only tolerable outcome will be a complete end to combined sewer overflows not just in the Gowanus, but city wide. These measures will help in the interim, but for the long haul our aging cities deserve Federal infrastructure spending to address what really is a regional and national issue. Aaron Naparstek eviscerates an ill-informed New Yorker column. Oh, and pity poor, poor John Cassidy, who drives a "heap" - a Jaguar XJ6. Like his previous heaps, which included an E-class Mercedes and a couple of Cadillacs. Clearly, just an average joe. Cassidy makes himself out an ignorant, entitled buffoon in his piece (no link from me, you'll have to click through Aaron's piece to see it). I expect more from the New Yorker than garbage like this. The Brooklyn Greenway Initiative is one of my favorite local non-profits that is making a physical difference in our community. The Greenway cleanups are a lot of fun - pitch in this Saturday! Please join Brooklyn Greenway Initiative and their friends at Columbia Waterfront Neighborhood Association for the first monthly clean-up of the year along the Columbia Street segment of the Brooklyn Waterfront Greenway. Tools and gloves provided, all ages welcome! 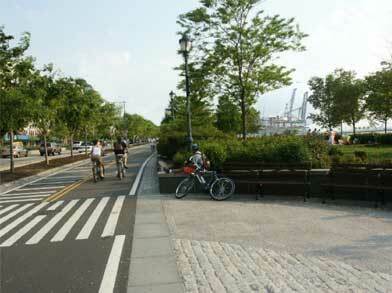 Meet at Brooklyn Greenway Initiative’s office, 145 Columbia Street, on Saturday, March 12th. Clean-up runs 10:00AM-12:00PM. To RSVP or for more info contact Brian at bmccormick@brooklyngreenway.org. With a title like that, this post will probably disappoint: I don't have the answer yet on when the 2nd Place entrance will be thrown open for the community. The construction has seemed to last forever, but there is finally a light at the end of the tunnel. And yesterday, an opening in the construction fence. I took a closer look and snapped a couple shots of the once and future entranceway. Note the steel beam above the entrance which presumably will support the entrance signage. On closer inspection, it looks like the entranceway will be partly glass on the Smith Street side, providing a little extra visibility into the entryway when the commercial space is open. Finally, I took a longer shot from the stoop of the derelict property across the street. This was a hard-fought and amazingly long battle. Despite the contextual re-zoning and a valiant effort by the community the developers were granted a variance by the Board of Standards and Appeals to build to the full extent of the old zoning law. It's hard not to be bitter about an outcome that, in my opinion, was unsupported by the facts or the law. But it's more productive (and healthier) to look on the bright side, since we can no longer change the outcome. The mature trees on 2nd Place survived. 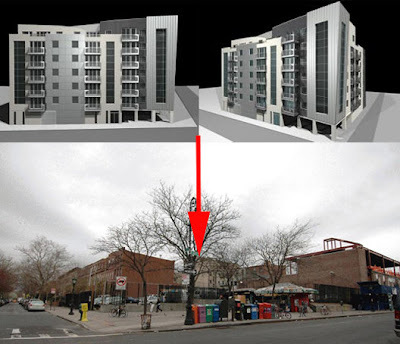 The original "Heavy Metal" Scarano facade was scrapped (graphic originally from Curbed). The Quadrini design certainly isn't perfect, but it's a measured improvement over that. Lastly, the old gravel parking lot which encroached on a substantial portion of the block's courtyards and was, frankly, a blight on the corner, is gone. The 24-hour residential presence over the subway entrance will improve security in the late night hours. And it won't be long before the construction fences will be down, the subway entrance re-opened, and the next battle for neighborhood preservation is joined. The major construction going on, which requires an enormous and deep trench the length of Court Street from 1st to 2nd Place, is due to the replacement of a sewer line. There is a good size crew moving this along at a fairly rapid pace. Here is a busted up old iron pipe that the crew pulled up in the excavation. Also of interest - a crew is ripping up 4th Place from Smith to Court. I asked the workers yesterday if this was related to the sewer project. The answer was much more exciting: FiOS! I don't want to get my hopes up too high but Verizon FiOS is long overdue in the area and Time Warner could seriously use the competition. Bring on the high speed internet access! Update on the aftermath of the gas leak in front of the CVS store on Court Street. When the utilities were fixing the leak, they accidentally cut a water line, and Court Street had to be closed because the water was cascading down to Hamilton Avenue. I haven't talked to anybody about this, so these are my observations while doing errands in the hood. Can't help to think that everything seemed to have gone wrong with the repair of the gas leak. But, thank goodness, we were lucky to not have had a San Bruno-type gas explosion, because you could smell the gas a block away. The contractor still hasn’t sufficiently patched the cut in the street after fixing the various leaks (gas/water). The sidewalk from 1st to 2nd Place was cut in the last week to install yellow plastic pipes for some utility. Construction barriers are in place on the sidewalk from 1st to 2nd Place. Con Ed cut the street, next to the curb, on First Place yesterday to install new yellow plastic pipes for electricity yesterday. A worker said that electricity was accidently cut for 122 First Place during the gas leak fiasco, and ever since, the building has had their electricity spliced from a light pole. The worker mentioned that water was also accidently cut for a building on 2nd Place during the fiasco. This morning I received a link through the TransAlt Brooklyn Google-Group to what really is the definitive PPW Bike Lane Benefits For Idiots guide. Huge fonts, simple, clear analysis, and obvious conclusions. It really is incredible that the NBBL-ers can continue to deny reality with a straight face. So it was by way of that link that I found the Brooklyn Brainery, which I had not noticed before though it's right here in the neighborhood. It looks like a pretty neat place, and I look forward to checking it out. Brooklyn Brainery hosts cheap classes on anything and everything. It's a place to experiment with all the things you've wanted to learn but just haven't gotten around to yet -- thinkbook clubs on steroids. We're located in Carroll Gardens at 515 Court Street, a couple blocks from the lovely Gowanus Canal. Their course catalog is HERE. Not exactly in the Carroll Gardens footprint, but our good friends Steve and Sarah are opening up a great new space with yoga and integrated health services (acupuncture, herbs, massage therapy and psychotherapy) called Plaza Wellness. The space is located just off Grand Army Plaza at 36 Plaza Street. They're having an open house this weekend and free yoga classes - a great opportunity to check out a new local business run by terrific people. How can we make a great thing even better? NYC has declared a weather emergency. The snow is forecast to become more severe this evening and overnight. The public is urged to avoid all unnecessary driving during the duration of the storm and until further directed, and to use public transportation wherever possible. If you must drive, use extreme caution. Information about any service changes to public transportation is available on the MTA website. Any vehicle found to be blocking roadways or impeding the ability to plow streets shall be subject to towing at the owner's expense. Jonah Blumstein, Liaison, CCmember Brad Lander; Tamar Smith, State Assemblywoman Joan Millman; Alex DeLisi, Sen. Dan Squadron; Dan Wiley, Rep. N. Velasquez; Luke DePalma, BP Marty Markowitz. City Councilmember Brad Lander: State of the Borough updates and plans. The CGNA listserv is an all volunteer community forum serving Carroll Gardens. Everyone from the neighborhood - renters, owners, business owners and others who work here - are welcome. The CGNA meets at the Hannah Senesh Community Day School, 342 Smith St (1st & 2nd Pl) on the Fourth Wednesday of each month (except for school holidays in *February and *April). The 2011 calendar: Wednesday, *Feb. 16, Mar. 23,* Apr. 13, May 25, June 22. And it's a full agenda after our last meeting was blizzarded out. Conveniently located at PS 58, 6:30pm. Presentation and discussion with a representative for the Department of Environmental Protection on the NYC Green Infrastructure plan, a a new plan to utilize "green infrastructure" improve the quality of waterways around New York City by capturing and retaining stormwater to reduce sewer overflows. Presentation and discussion with a representative for the Stormwater Infrastructure Matters (S.W.I.M.) coalition, a Citywide coalition dedicated to ensuring swimmable waters around New York City through natural, sustainable stormwater management practices in our neighborhoods. Presentation and review of a cabaret license application submitted to the Department of Consumer Affairs on behalf of Paris Burlesque Club at 18 Commerce Street (between Columbia/Richards Streets). Presentation and review of an on-premises liquor license application submitted to the State Liquor Authority on behalf of Paris Burlesque Club at 18 Commerce Street (between Columbia/Richards Streets). (Laid over from November) Presentation and review of a renewal unenclosed sidewalk cafe permit application submitted to the Department of Consumer Affairs on behalf of Stone Park Corner LLC at 324 5th Avenue (northwest corner 5th Avenue/3rd Street), to permit 11 tables and 22 seats. (Laid over from December) Presentation and review of an on-premises liquor license application submitted to the State Liquor Authority on behalf of 381 7th Avenue Restaurant LLC at 381 7th Avenue (between 11th/12th Streets). (Laid over from December) Presentation and review of an on-premises liquor license application submitted to the State Liquor Authority on behalf of 140 Business LLC at 140 7th Avenue (between Carroll St/Garfield Pl). (Laid over from December) Review and discussion of potential addition to the Brooklyn CB6 Responsible Development Policy. Despite that address, if I recall correctly we always enter from the Carroll Street side. *Update on the partial street collapse on Court Street, between 1st and 2nd Place. One lane of traffic on Court Street has now been re-opened. All agencies are working together to limit the impact on the community. It is still unknown at this time how long the work will take to complete. Should Court Street need to be closed again, a new traffic diversion plan has been established between the 76th Precinct and the Traffic Agents that should reduce the traffic congestion that was experienced earlier. So what happened? (Katia already entirely beat me to this, but I've already written the post, so here's my experience and pictures anyway) On Wednesday afternoon Mia was returning from work on Long Island. "What's going on? Our block is closed off, Court Street is blocked off, there's emergency vehicles and police everywhere." Time to investigate. Outside, 1st Place was empty, but I could see the commotion at Court Street. Traffic on Court was being diverted at President Street. Court Street was ripped open in front of CVS between 1st and 2nd Place. There was a gas leak in front of CVS last night that you could smell throughout the neighborhood, and Court Street was closed, and they were detouring cars up 1st Place to Smith. It was pretty noisy outside, as cars were unhappy. It was pretty scary - as you couldn't help but think of the San Bruno, Pacific Gas and Light explosion. Court St has been temporarily closed between the Brooklyn-Queens Expressway and President St in Brooklyn due to a flooding condition. Expect heavy traffic delays in the area. National Grid has cut and capped a gas main which services 391 thru 395 Court Street (one building with several addresses). The building has no gas at this time. During repairs a 4-inch sprinkler service water main was broken. DEP has isolated the break. DEP and FDNY are removing 5 feet of water in building's basements on Court Street between 1st Place and 2nd Place. Court Street is closed from President Street going south. The B57 bus line is being rerouted. OEM operations continue. An Interagency meeting was conducted with the following agencies in attendance: Con Ed, National Grid, DEP, DOT, NYPD, FDNY, building owner, and the building owner's contractor. DEP states that all residents have had water service restored. The source of the leak has been identified as the sprinkler service line. The sprinkler line service has been discontinued and the water leak has been terminated. Con Ed will first have to remove duct infrastructure before the building contractor can begin work on repairing the sprinkler line. Con Ed is going to start their operations as soon as manpower and material are on scene either tonight or tomorrow morning. National Grid is placing a temporary service line to restore all effected costumers. National Grid will begin perrmanent repair work after the building contractor has completed his phase of the repair work. All customers will have gas service restored tonight. DOT is going to open up the west side of Court Street to vehicle traffic until work begins tomorrow morning. DOT will place pedestrian safety control devices at the location tonight. Vehicle traffic will be closed tomorrow morning when repair work begins again. The hole to be back filled is approximately 10x30 feet. DOT will return tomorrow morning to coordinate the back filling process. Backfilling will be conducted in phases of repair. Backfilling will be in conjunction with each utility company's completion of repair work. The building owner has hired a licensed water main contractor that will begin repair work to the sprinkler line after Con Ed has removed electric duct work from the affected area for safety reasons. NYPD will maintain a presence for vehicle and pedestrian traffic. FDNY has concluded de-watering operations and is taking up from the scene. ﻿It's amazing what an impact a seemingly small utility issue can have isn't it? On my walk back from the YMCA last night there were a lot of frustrated drivers on Court and side streets between Atlantic and 1st Place. Fortunately, the sidewalks were open for business. ﻿I passed through the recently (and aptly) re-named Fulton Street (formerly Broadway-Nassau) subway station for the first time in months on Tuesday. Due to the construction work overhead it was actually raining on the platform in places. While this project has taken forever, I am really looking forward to seeing and using the finished product. This place used to be a stinking dungeon - I can't wait to see a more open layout with some natural light. Also finally had a chance to use the Jay-Street Metrotech connection to the R an hour later. Very nicely done, and actually more convenient than I had imagined it. Hey Brooklyn - Smarten Up! I'm a month late to posting this, but now that I've had a chance to clean up my desk it's still worth putting up. Cycling and livable streets advocates have had a contentious relationship with the Borough President. I've personally found his perspective on bike lanes, traffic calming and PPW in particular to be . . . frustrating. So I was genuinely and pleasantly surprised when the BP's office came out with this informative and balanced flyer. A timely reminder that even when you disagree, even strongly, on some issues there can be areas of common ground to work together. Anyway, this is a welcome step in the right direction. Barry Ritholtz nails the right reasons for blogging, at least as they apply to me personally. There are many times when I let this blog lie dormant, always because of a crowded and/or inconvenient work and meeting schedule. And when it's dormant, I have a constant gnawing feeling as my creative side, such as it is, demands an outlet. I'm constantly posting things to my Google Buzz feed, because it's so easy, and occasionally to Facebook, but neither is a satisfying substitute for blogging. Now that I've finally got it set up the way I like it (a mere three and a half years after starting) I expect to have a more interactive experience with the occasional friends, random commenters and trolls who stop by. - Presentation by representatives for the Department of Transportation on their findings and recommendations regarding the Prospect Park West bicycle lanes and traffic calming project installed in Summer 2010. Thursday night is an important opportunity for PPW bike lane enthusiasts to hear the latest from DOT and show support for the lanes. There is a small cadre of PPW residents who are implacably opposed to the bike lanes for a variety of parochial reasons. It is imperative that the people who use and appreciate the bike lanes on PPW come out to relate, with well-reasoned and respectful language, why the bike lanes are important to the community. I understand that Neighbors for Better Bike Lanes (the curiously named opposition group whose members showed up to heckle at our last meeting to review the Lander/Levin bike lane survey results) will be there to demonstrate their opposition to the lanes. It's no secret that I'm a supporter of the traffic calming bike lanes that DOT installed on Prospect Park West last year. I do believe that the lanes can and should get an aesthetic makeover to blend in better with the Park they abut - think West Side Highway where the bike lanes make an attractive component of the riverfront park. A small, vocal and well-funded minority wants to scrap the lanes altogether and return PPW to a three-lane speedway. And we can't let that happen. MTA representatives (including Thomas Pendergast, President of New York City Transit) told us that they believe that “backriding” (i.e. taking the train south) to Church Avenue, and then switching to the northbound trains, will be the fastest option for F/G riders. That may be true for some, but I strongly believe that extending service on existing bus routes would be quicker for many others who will be extremely inconvenienced by the station closures, and is the right thing for the MTA to do. One great suggestion I have heard from many of you is to extend the B68 bus (which runs along Prospect Park Southwest and Coney Island Avenue) past its usual terminus at Bartel Pritchard Square (at the 15th St/PPSW Station), to 9th St and 8th Ave, where riders could pick up the F train. This would make for an easier commute into Manhattan and Downtown Brooklyn for many in Windsor Terrace and Kensington. MTA officials agreed to take another look at this idea. So I have set up a petition, and my staff and I will be out on Tuesday morning, together with the Straphangers Campaign, at the 15th Street and Ft. Hamilton stations gathering signatures. Please stop by on your way in, or sign the petition online. By themselves, though, these are not enough. I know that this is an extremely frustrating situation for transit riders in Windsor Terrace and Kensington. The station closures are part of a project necessary to rehabilitate the aging F/G line. But the MTA can do better to provide some alternatives. I will continue to push, and hope you will join me. I've signed on. I hope you will too. We took care of some errands in the neighborhood today and saw the meter maids giving out tickets like candy on Halloween. Just because alternate side parking is suspended, it doesn't mean that meters are free. Alternate side parking (street cleaning) regulations will be suspended Tuesday, January 18, 2011. All other regulations, including parking meters, remain in effect. The Brooklyn Downtown Star called me about the upcoming service disruptions on the Culver Line (F&G trains) that will leave many riders at Ft. Hamilton Parkway and 15th Street stations in the lurch. Transit advocates and local Councilman Brad Lander have called for NYC Transit to provide shuttle service along the affected route during the duration of the outages. The unfortunate reality is that that is unlikely to happen. Ideally, the MTA could take this opportunity to test out something new, such as running bus service through the Battery Tunnel to supplement the affected service area. But the chances for robust mitigation were essentially doomed when the State Senate smothered Congestion Pricing (and/or East River Bridge Tolls). I applaud our City Council Member Brad Lander for standing up for the residents of the 39th District and the visitors who depend on the F/G lines for their mobility. But until our dysfunctional state legislature provides sustainable means of funding for NYC Transit, the burden will fall on the riding public in the form of increasing fares and diminishing services. One thing you can do to let Albany know how important reliable mass transit is to NYC is join the Rider Rebellion sponsored by Transportation Alternatives. One small thing: what we are actually pushing for on the F/G is not shuttle service, but simply a short/temporary extension of the B68 (which runs up Coney Island Avenue and Prospect Park SW, through sections of Windsor Terrace & Kensington served by the 2 stations there facing closures) from its current terminus at Bartel Pritchard Square/15th Street Station, to the 7th Avenue F/G Station. We'll have an online petition up tomorrow, and Straphangers & I will be out at the stations tomorrow petitioning live. This is a sensible and cost-effective fix that would be a win for everyone involved. Transit users would gain from the improved service mitigation, and the MTA could benefit from some much needed good press. I'll have more on this later, but for now two things. 1. Shuttle buses replace subway service on the F/G lines between Jay Street and Church Avenue this weekend. 2. Four months of pain for riders at the Fort Hamilton Parkway and 15th Street F stations begin early Saturday (midnight Friday night). Even greater hardships await users of the Smith-9th Street station over the next two years. Both 1 and 2 above are due to necessary work on the Culver Viaduct Rehabilitation. For more on the these disruptions, and indeed for all your weekend service advisory needs, head to Second Avenue Sagas for the scoop. Image credit - MTA via Second Avenue Sagas. I've been talking about seeing this show for going on two years now. Still haven't seen it. And once again this weekend we have something else planned. But it looks like a great time. Has anyone seen it? audio/visual equipment, cell phones & PDA's. Another indication of Chris Christie's contempt for transit, or merely an unfortunate lapse? The NJ Transit site is down, because the domain lapsed on January 7th and wasn't renewed. Of course, this is the one day I have to take an NJ Transit train.